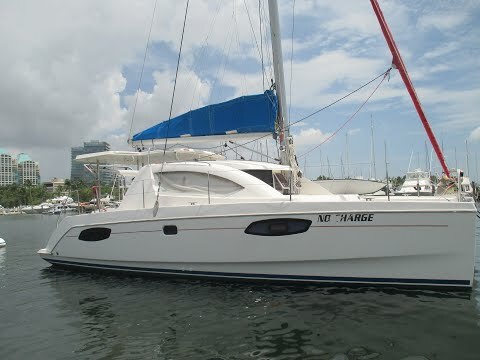 Leopard Catamarans introduces the 2010 Leopard 38 No Charge. Located in Coconut Grove (Miami), very well maintained with several nice upgrades. Duty Paid, this one is priced to sell, shows well, turnkey ready. BUILDERS REMARKS: The performance driven Leopard 38 is at the heart of the Leopard line. With her generous sail plan and stepped hull design, this yacht provides excellent performance. On deck, the space is well thought out and useable; from the large transoms to the open and spacious aft, side and forward decks, getting around this yacht is easy and safe. The hardtop bimini over the cockpit provides superior protection from the elements and also offers a stable working platform. BROKERS REMARKS: No Charge is offered with four double cabins, two head layout which gives plenty of room for group or families, plus additional fore-peak berths ideal for small children or simply extra storage. With sheets all run to the helm, electric winch at helm, and reliable under motor with Yanmar engines, anyone looking for a mid-size cat will find this yacht attractive. This yacht underwent a complete phase-out (refit) by Sunsail in 2016. Dockside AC is nice for those hot days in the marina, and stainless steel electric davits makes stowing the dinghy easy. No Charge is wired and plumbed for a generator, she has a new rig (2016), and owner installed Victron Charger / Inverter, a new A/C unit, fresh water foot pump in the galley, new engine starters, a new Raymarine Evolution Autopilot, and fuel polishing / transfer system by Gulf Coast Filters. Ready to sail now.